OCCASION: : Concept for "Rencontres internationales Paris-Berlin-Madrid "
The Jeu de Paume Museum is located in the oldest and most significant park [Jardin des Tuileries] in central Paris. It was commissioned in 1564 by Katharina von Medici. It was also in this year that construction work began on Katharina von Medici's Palais des Tuileries [Brick Palace], the old royal and imperial seat. The castle was the royal residence of numerous princes until it was destroyed by fire in May 1871. The ruin was demolished in 1882. A small portion of the remains of the castle was, however, transported to Schwanenwerder Island in western Berlin. A particle of patina was taken from the remains of the castle, a 'column' of the castle ruin. In the "AUGADORO" [Eye's Door] media installation, the particle of patina from the destroyed Palais des Tuileries was the "objet trouvé". The insight into "the column's" colourful microcosm, its patina, enables, "the column" to become a symbol of past, present and future. Modern technology is used to create and delate living history. Nature and culture meet in their original environment - the oldest park in central Paris. A coloured, self-adhesive and slightly transparent foil was affixed to the museum's window. The foil was printed with microscopic images of a particle of patina which had been taken from the remains of the destroyed Palais des Tuileries - a column that has been standing on Schwanenwerder Island in western Berlin since 1882. The window glass is the substrate for the digital image worlds. Complex images on glass windows, based on various techniques, have been in use since gothic times. 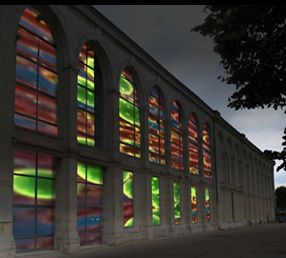 In the "AUGADORO" media installation, the colourful microcosm of "the column" from the destroyed Palais des Tuileries is depicted in its original environment when darkness falls. A particle of patina, which has been taken from the remains of the destroyed Palais de Tuileries, is positioned under a video microscope in the museum. The video microscope is connected to a notebook PC and the microscopic images of the patina particle which are recorded are live streamed over the internet from a public-access website. The notebook can be used to send messages, information about the project and live images of the patina by e-mail or mobile phone (with Bluetooth).